Review Fix chats with independent video game designer Itay Keren, who discusses his game, “Mushroom 11.” A witty and wonderful combination of “Locoroco,” “The Incredible Machine” and even “Braid,” its amazing physics engine art style and score is sure to grab hold of you. 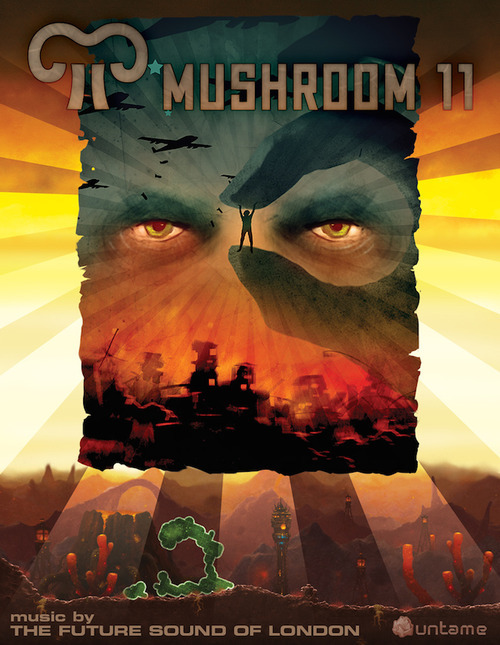 Review Fix: For those who haven’t played “Mushroom 11,” can you tell us a little about the project? Itay Keren: Mushroom 11 is a game I started with my wife two years ago during the 2012 Global Game Jam at NYU. Mushroom 11 is puzzle-platformer which tells the story of an amorphous organism roaming a destroyed world beating various skill and logical challenges along the way. The truly unique element in the game is its control mechanics – you can mold yourself into any shape by pruning your cells, and even split yourself into pieces. When cells are removed, new ones will immediately grow, allowing you to traverse this mysterious world and solve its challenges. Review Fix: The physics engine is insanely simple, but wonderfully complex, how did this idea come to you? Keren: Originally the idea came up quickly during the Global Game Jam (GGJ). In my eyes it had direct correlation to the GGJ theme which was the Ouroboros, the symbol of the snake eating its own tail. I wanted to make a platformer (just because I love that genre) where the protagonist cannot move without destroying itself. In some sense I tied growth and destruction just as that symbol suggests, and integrated it in a 2D physical world. I tried many different versions of this growth, but it was clear that the fun is there. It had this toy-like quality which I tried to preserve and improve since. Review Fix: What’s your favorite element of the game? Keren: It might sound weird, but my favorite part is coming up with puzzles. I know this doesn’t really answer the question. The game has many parts that I thoroughly enjoy, like using shape and balance to solve puzzles, or the quick mindless tunnel traversal. But to me, the pure joy is coming up with the challenges that the Mushroom 11 world allows, and discovering new ways of using this versatile mechanics. Review Fix: What games did you play as a kid and how do you think they influenced this one? Keren: I definitely see a lot of influences on Mushroom 11 by games I grew up on. Games like The Incredible Machine or Bridge Builder, demonstrated how physics can be used to solve complex puzzles, allowing different, personal solutions to be used by different people – all tied in an approachable, almost childish package. I also grew up on platformers like Shinobi or Wonder Boy, which I used to sometimes skip school to play in the video arcade. I guess my affection to 2D worlds that end with scary bosses, mostly stems from nostalgia. More recently I enjoyed and spent hours on World of Goo, Braid and Limbo, which introduced news ways of puzzling the player with their own truly unique worlds. Review Fix: How important do you believe games like this are that work just as well on the iPad as they do the PC? Keren: To be honest, I believe a game should be played anywhere it feels natural. I don’t think platform decisions should necessarily be part of the game design. Mushroom 11 is fortunately just as enjoyable when using a mouse as it is on touchscreen, but if it doesn’t really work with gamepads, I won’t force it. Platforms shouldn’t be superimposed on the design, or it will show. Keren: When I started showing it to friends or in festivals, I really didn’t know what to expect. It’s not a standard platformer and not just a puzzle game so in some sense its audience is not neatly defined, which is wonderful. After some showings it was clear that not only is there no clear player type for the game, but actually we saw a lot of players who wouldn’t consider themselves “gamers” picking it up and doing just as well, and sometimes even better. Review Fix: How do you want it to affect people? Keren: I want Mushroom 11 to be completely open and free of player predisposition. I see a lot of players being surprised with the mechanics, essentially being required to learn a new control language. This draws a clean slate where all players are allowed to experiment with this organism and come up with their own creative solutions to the different puzzles thrown at them. Even the way the story is told requires players to be creative in their interpretation of past events. I want players to feel creative as they go through this world, solving its challenges and mysteries. Review Fix: How does it feel to have The Future Sound of London associated with the project? Keren: Huge honor. I’ve been a fan of FSOL for two decades, ever since I heard their epic album Lifeforms. I used to listen to that album when designing the Mushroom 11 world, and its ambience fit the design perfectly. In fact, you could say that it drove many design decisions in terms of atmosphere, visuals and narrative. So at some point I was thinking, well why shouldn’t I just try to get their music in the game? Eventually I was able to get them on board and license their music, and I couldn’t be happier. Review Fix: The game has gotten a ton of mainstream coverage from IGN in particular. How does that make you feel? Keren: Well, it does get its share of attention but it’s still completely unknown outside the indie circles. I was fortunate enough to have one of my heroes (and now my backer) Jonathan Blow demo the game in a press event, so naturally I got some favoring coverage but the game is still unknown, which is just fine because it still not released. I do hope to get more mainstream media attention when it really matters, during the launch campaign.